Podcasta la Vista, Baby! Episode 3 – Hercules in New York | Radio vs. the Martians! This entry was posted in New Episode and tagged arnold schwarzenegger, arnold stang, bear fight, greek mythology, hercules in new york, podcasta la vista baby, pro wrestling, sam mulvey, so new york it's oozing pizza grease by Mike Gillis. Bookmark the permalink. Arnold Stang was always awesome. For me, he was Catfish, the sidekick to Mr Jaws, in the Saturday morning cartoon (from DePatie-Freleng, who did the Pink Panther cartoons). That was back in the 70s, when Jaws came out. He also has a fantastic role in It’s A Mad, Mad, Mad, Mad World, as 1/2 of a pair of gas station attendants who have to deal with an enraged Jonathan Winters. Apart from the Honey Bee, he had a great small role in The Cosby Show, in the episode with Sammy Davis Jr.. I saw parts of this film, on tv, when I was in college. The most jarring thing was hearing Arnold dubbed. I was used to that kind of thing in Hercules and other sword & sandal films; but, I didn’t know those actors beyond the dubbing. The closest I can compare it to was seeing Mad Max and hearing Mel Gibson sound like Cliff Robertson (in the original US release, dubbed) and then hearing his Australian accent in Road Warrior and Tim. For a cheap film, though, it is entertaining, despite itself. It’s the kind of movie that was fun watching on a rainy Saturday afternoon, back before my family had cable. Back when you had syndicated movie packages for non-network viewing hours, you could catch a classic, a recent era film, or some bizarre B-movie, like this. Many times, the bizarre ones were the most entertaining. The pro wrestling element is something they couldn’t afford. This was during a peak period for pro wrestling, particularly in New York. This was the era of Vince McMahon Sr (father of the WWE promoter, Vince McMahon Jr) and Bruno Sammartino, as the WWWF champion. Bruno regularly sold out Madison Square Garden and he was prominent in newspapers (not front page; but, in the sports pages). Anybody who was working MSG wasn’t going to take a pittance to job to Arnold. 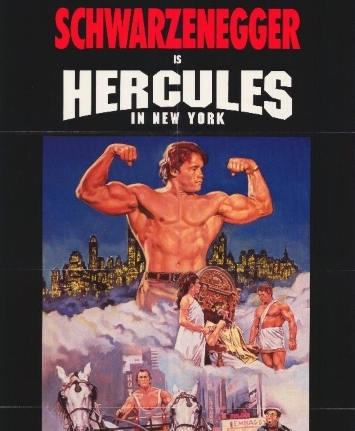 It would be a few years before we got pro wrestling movies, The Wrestler, with Ed Asner (featuring AWA World Champion Verne Gagne and wrestlers from the Minneapolis-based AWA, including a young Ric Flair) and Paradise Alley, with Sylvester Stallone and Terry Funk (former NWA World Champion).